No Ukrainian serviceman was killed or wounded in action in ATO zone yesterday, reported Ukrainian Ministry of Defense spokesman on ATO Colonel Andriy Lysenko at a press briefing at Ukraine Crisis Media Center. In Donetsk sector, militants violated the ceasefire 12 times. The situation was restless along the entire contact line, with the exception of Svitlodarsk area. Several intense firefights took place in Zaitseve and Maiorsk. “The enemy used armor. The hostile attack in Avdiivka continued for two hours in the evening. The ceasefire was also violated in Donetsk airport,” said Col. Lysenko. In Luhansk sector, Ukrainian troops recorded five hostile attacks. Militants were active after 16:00. “They conducted two mortar attacks in Lobacheve west of Shchastia. Russian proxies fired 17 rounds at our positions. 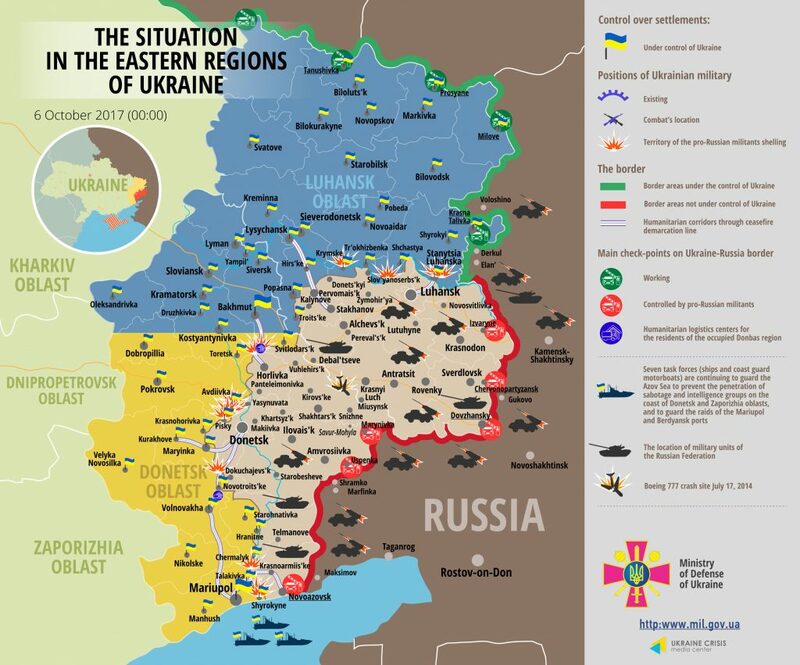 Moreover, the enemy violated the ceasefire in Stanytsia Luhanska district and in Krymske,” said Col. Lysenko. In Mariupol sector, militants opened fire in Berezove, Vodiane, and Shyrokyne. Ukrainian troops responded with fire. In total, seven hostile attacks took place in this sector. Col. Lysenko also informed that 11 trucks carrying humanitarian aid proceeded through Novotroitske checkpoint to the temporarily occupied territories. “These are food packages, the total of over 212 tons, from the UN World Food Programme and the Office of the United Nations High Commissioner for Refugees,” added the spokesman. Report on the military developments as of October 5 is available here. Interactive data on the shelling: chronology shelling chart and the interactive map.